Last winter I was on the hunt for a short sleeved sweater and had no luck finding one. I found a cute long sleeved sweater at Goodwill that had the potential, but it needed some adjustments. I altered the sleeves so that it was short sleeved and then used the part that I cut off to make some adorable little legwarmers for my daughter. I love the look of sweaters with leggings and boots, but I have a hard time wearing sweaters. I feel like I am going to sweat to death if I am indoors with a full sweater and long sleeved shirt underneath of it. Perhaps it is the fact that I don’t ever sit down. 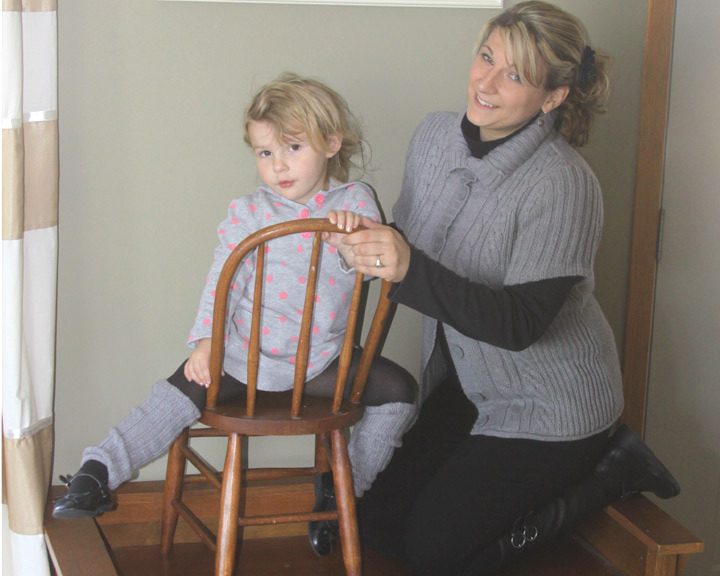 My two and four year old seem to keep me in constant motion, and being in a sweater gets uncomfortable. I get just too hot. I loved the idea of a short sleeve sweater to solve my problem. Last winter I looked and looked for a sweater that fit the bill with no luck. When my search for a cute short sleeved sweater failed, I reverted to my old motto. If you can’t find exactly what you are looking for … make it. I stopped in at Goodwill and found a simple grey sweater that I could revamp into what I was looking for. It had buttons up the front and a fun collar that allows me to wear it a few different ways. I simply cut the sleeves off where I wanted my short sleeves to fall, and then hemmed the raw edges. I folded the raw edge over twice, pinned and sewed all the way around for a finished look. The sweater is exactly what I was hoping for! My favorite way to wear it is with black jeggings, and my black riding boots. It is a simple easy style and it allows me to chase after the kiddos without overheating! I love to put my hair up and the style in these photos is a 5 minute updo that I made using overnight sock bun curls. If you like the like the look I show you how to do it here. I have heard of people using old sweaters to make legwarmers and decided that this was the perfect opportunity to give it a go! 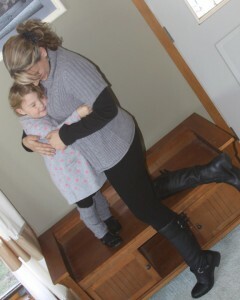 I always feel guilty putting my little girl in tights (no matter how warm they are) during our harsh Wisconsin winters. 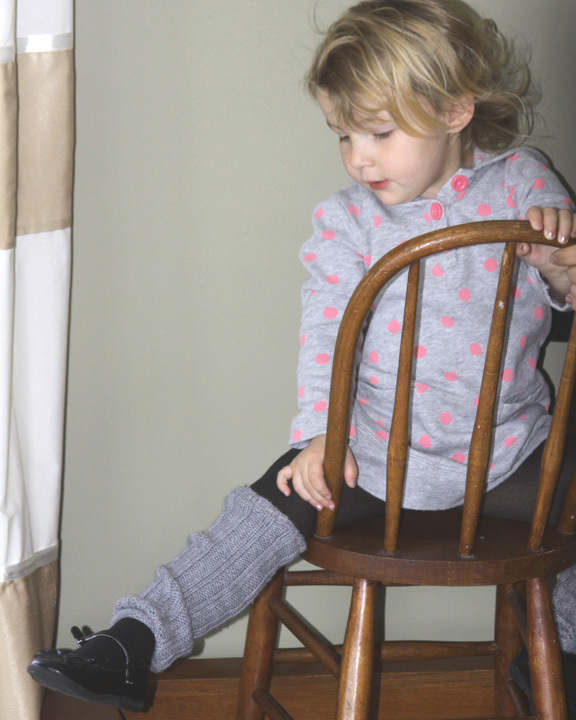 What better way to keep her little legs warm than with these adorable little legwarmers over her tights? These were so simple to make. I just took the sleeves that I had cut from my sweater that I refashioned to create the legwarmers. I used the cuff of the sleeve (that would go around the wrist) as the bottom of the legwarmers (that go around the ankle). This way I didn’t have to hem that end. Because the sleeve was too big for her tiny calves I cut all the way up the sleeve in a straight line so I could make the sleeve smaller. I measured, using my daughters leg, how long and wide I wanted the leg warmers to be. One hem on the top for a finished look again and a straight stitch up the back of the old sleeve was all it took to turn a sweater sleeve into a legwarmer. This are the perfect addition to her dresses and tights. They look adorable with little ballet flats and even better under her boots, in my opinion. 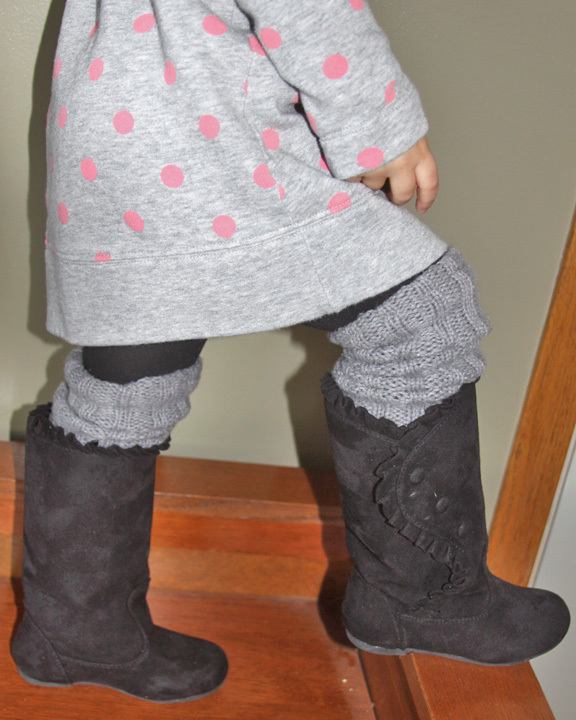 My daughter is just too cute with her little legwarmers on and now I don’t have to feel guilty when I put her in those dresses and tights during the winter. They keep her nice and toasty warm when we are on the go. One $5.00 Goodwill sweater has now turned into some adorable little girl leggings and I sweater that I love to wear over and over again. This is by far my favorite re-fashions to date. These would make a great gift for any little lady in your life and can be as simple or fun as you want – depending on the sweater you choose! Very cute! I love the sweater and the leg earners! You look great in that outfit. Do the hems you sew into the sweater fabric hold up well in the washer? Thanks Bailey! I wash it with my dedicates and air dry it (but i guess I do that with all my sweaters) and no problems! Thanks for stopping by fellow Wisconsinite :)! Awesome to hear you are going to give this a go! !